The Avengers have had a... lively roster, over the years. 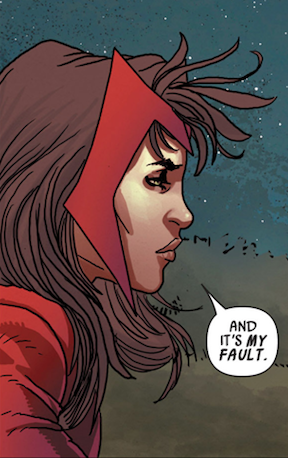 Wanda Maximoff, aka the Scarlet Witch, has been an Avenger more than once, and currently serves in Uncanny Avengers. Here's why that's a bad idea. So I thought I'd start with the big one and get it out of the way. 'Unstable' is a word used in fiction from time to time to describe folks who are crazy, or on the verge of snapping. (Will Graham on the outstanding series Hannibal is a recent example.) I honestly can't think of a better example than Wanda. She is unstable. She's emotional, her powers don't always work the way she expects them to, she's made snap judgments that have negatively impacted the entire world. (That is sadly not an exaggeration.) Also? She's extremely impressionable. Obvious bad guys have convinced her to join their cause on a few occasions. Let's not even go into the old days with her dad. I'm talking about the time she was engaged to Doctor Doom. Or the more recent time when the Apocalypse Twins convinced her it was a good idea to tear every last mutant on earth out of their homes. Not the clearest thinker, our Wanda. So just before the mega-series Avengers vs X-Men, Wanda went to the Avengers mansion to try and make amends, and maybe rejoin the team. Vision, her ex-husband, wasn't having it. Seeing as she was at least somewhat responsible for Avengers Disassembled, that's perfectly understandable. She's had similar problems with Rogue, who eventually agreed to work with her. Long after she was a member of the Brotherhood of Evil Mutants, she de-powered most of Mutantkind with three words; the single worst thing ever to happen to her species. She made a few more messes over the years, trying to clean that one up. (See above, re: engaged to Doctor Doom.) I get that she wanted to make things right, and to her credit, she ultimately did. But I can't think of a single mutant who's looked at her the same way since that horrific event. So in the first major arc of Uncanny Avengers (which only wrapped up completely with #22), the Apocalypse Twins were dead-set on transporting every last mutant man, woman, and child off the Earth, to some distant planet to form a new society, far away from the abysmal future in store for them. To wit, they recruited Scarlet Witch to use her crazy reality-warping powers to make this happen. They talk her into it. She agrees to this plan. Not only is segregation the antithesis of everything Charles Xavier worked for, but this elitist "I'm doing it for the greater good" thinking is what's gotten her into trouble before. Still with me? Wanda gets in cozy with the Apocalypse Twins— all the while, plotting to betray them. There's just one problem: they anticipate this. They anticipate that she's going to double-cross them, and work out a way to negate it. Their plan goes off so well, the Avengers need time travel to fix things. So the Avengers show up again (several hours earlier this time) and stop the Scarlet Witch from carrying out her crazy plan... with no repercussions at all. No blame, no "what the hell were you thinking", no "we're gonna have a serious talk about this later". Super-teams like the Avengers and the X-Men have gotten together before to actually talk about whether or not killing Wanda Maximoff was an appropriate thing to do. At the time, her powers were out of control (again) and she was endangering the planet. Now I'm not saying she deserves to die. Far from it. She just needs to be removed from any position of influence over anything else. At all. The fact that she means well doesn't counter the damage she's done, nor the aftershocks of what she's done. She's unreliable, unstable, she works poorly with others (or rather, others work poorly with her), and her powers do more damage than good. Fire her.